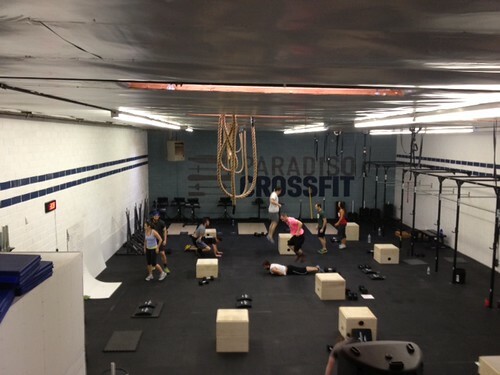 Home » WOD Blog » Sunday Funday! Reminder! Farmbox Delivery tomorrow betweeen 10 and noon! Kettlebell Class TODAY- 10am in Venice! Bring a Friend Day was a success!! Below is a very tasty cauliflower rice recipe adapted from nom nom paleo! Cauliflower rice is a great addition to any meal. You can play with other ways to season it! When I make my cauli-rice I crack the eggs in the pan with the rice, cooking it and mixing it at the same time. When following the recipe below you can cook the egg either way and it will work. 1. Pulse the cauliflower in a food processor or blender until the pieces are the size of rice . 2. Toss the diced bacon into a large cast iron skillet over medium heat until the bits are crispy. 3. While the bacon is cooking, whisk the two eggs in a small bowl with some salt and pepper to taste. When the bacon is done, remove the crunchy goodness to a separate plate. 4. Pour the whisked eggs into the hot bacon grease and fry a thin egg omelet. Take the egg out of the pan, slice it thinly, and set it aside. 5. Take the ginger, peel off the skin with my vegetable peeler, and microplane it. 6. Crankup the heat of the cast iron skillet to medium-high heat and add the chopped onions (along with a dash of salt and pepper). Once the onion softened, toss in the sliced mushrooms (along with yet another sprinkle of S&P) and stir-fry everything until the mushrooms are browned. 7. Then add the ginger and stir it around for 30 seconds, then throw in the cauliflower sprinkle with more salt and pepper. 8. Put a lid on the skillet and lower the heat to low and cook it covered for about 5 minutes. When the cauliflower is tender (but not too mushy), add the coconut aminos, the herbs, and the sliced egg omelet.